Initially the idea of a tribute band recording a concert DVD seemed a bit strange to me, but one of my PR contacts asked if I’d review it as he felt I would be fair and honest, owing to my reputation for saying what I think! I’m probably well positioned to write such a review because while I fully respect Pink Floyd’s talents and success and I am familiar with a fair number of their songs, at no point would I ever profess to being a “fan”. As such, I’m less likely to draw unfavourable comparisons to the real thing. The first thing I need to do is obliterate the “tribute band” tag I so unfairly assumed. The fact of the matter is The Australian Pink Floyd Show is an authentic recreation that began in clubs in 1988, built up and has ridden on the back of success in the form of over 3 million tickets sold and world tours, including a date booked at the 02 Arena here in the UK next year. From the very moment ‘In The Flesh’ opens proceedings it’s clear the ten piece band are as impressive as the superb light show. With three lead vocalists they can confidently select music from any era of Floyd’s catalogue and cope admirably. This is highlighted with them travelling all the way back to the late Syd Barrett’s era with a spectacular ‘Astronomy Domine’ while including ‘High Hopes’ from Floyd’s last album ‘The Division Bell’. The band have made every effort to bring a psychedelic element to some of the older material, while still embracing all the smoke, lasers and lights that make Floyd such a well known live attraction in subsequent years. The performances are interspersed with interviews and backstage footage which help illustrate what a gargantuan undertaking the tour is – a staggering array of equipment, computers, lights, effects and crew are revealed and it’s obvious as much care has gone into the visual side as well as the audio. Despite including three songs from the monstrous ‘Dark Side Of The Moon’, I realised the majority of Floyd songs I know well, such as ‘Another Brick in The Wall’, ‘Run Like Hell’ or ‘Shine On You Crazy Diamond’ aren’t even on the DVD – only ‘Comfortably Numb’ from my list of well-known Floyd tracks appears. This is a show that wants to recreate the feel of Pink Floyd, not just go out and play “the hits”. 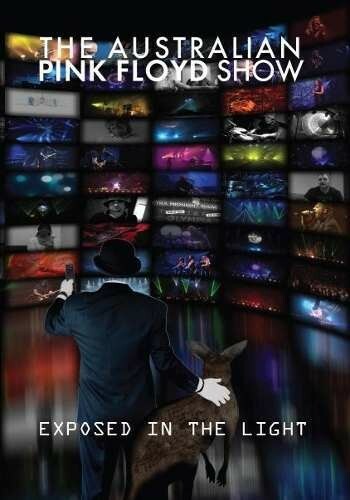 After watching the DVD I understood exactly why The Australian Pink Floyd Show has been so successful. With the real thing forever etched in the annals of rock history, this show, put together by true aficionados, gives you a chance to relive the majesty of a Floyd concert – or, for younger fans, experience the closest thing to it. I’m sure some Floyd die hards will find fault somewhere, but for me, I thought it was a show of the highest calibre.